Enjoy a Surf Lesson Camp in some world class waves rolling in from the Wild Atlantic Sea at Lahinch Surf School. Let skilled instructors introduce you to the art of surfing. You will learn how to perfect your “POP UP” to your feet in 1,2 or 3 steps! Lessons are held in waist deep water so you don’t need to be an amazing swimmer. The duration each lesson is approx. 2 hours long, 90 minutes of which is spent in the water. Wetsuits and Surfboards are provided. Participant age must be between 9 - 18 years. This experience is weather dependent. Lahinch Surf School is based in Ballyfaudeen, Lahinch, Co. Clare. 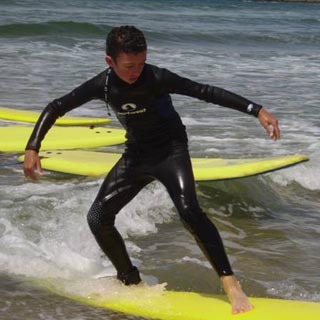 Lahinch Surf School's Kids and Teen Camps operate throughout the summer and school holidays. Advance booking on AllGifts.ie is required.